Flash wire buzzer game by Galaxy Graphics. Flash Games licensing. You may have played this at home, or tried to win a prize at a fairground; now you can play online: Simply pass the hoop around the wire circuit in the fastest possible time, without touching the edges and making it buzz. It sounds simple but it's much more tricky than that. 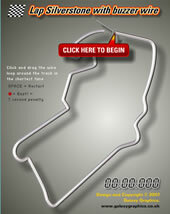 The Wire buzzer game here features the wire in the shape of the British Grand Prix circuit: Silverstone. The game and wire shape could easily be recreated into any shape you want. Use the shape of your logo or the shape of your product / message. Looking for buzzer game source code in actionscript? The source code for this Flash buzzer game is also available to buy from Galaxy Graphics. Click here to contact us about Wire Buzzer Source code.